Happy Sneak Zucchini on to Your Neighbor’s Porch Day! Incredibly glad my neighbor didn't catch me as I just moved here, and that might not have been the best first impression. We don’t make this stuff up, people. Today really is “Sneak Zucchini on to Your Neighbor’s Porch” Day. Zucchini are really easy to cultivate, which leaves over-zealous zucchini planters with a surplus of zucchini around this time of year. So what better way to get rid of it than to dump it on your neighbors porch? Zucchini is a summer squash which is part of the cucumber and melon family. The word zucchini comes from the Italian word zucchino meaning small squash. The flower on a zucchini plant is edible as well as the fruit. Zucchinis can grow up to several feet long, but are usually harvested at about 20 cm (~8 in) when the seeds are still soft and immature. The largest zucchini ever grown was 69 1/2 inches long and weighed 65 pounds! Zucchinis only have about 25 calories. For reference, a typical baked potato has about 150 calories, and an avocado has about 380 calories. Zucchinis have more potassium than bananas. I really like bananas though, so I’ll probably keep eating them. The town of Obetz, Ohio has an annual Zucchini Fest each year. This year it’s August 25-28, and Rick Springfield is headlining! The Zucchini Brothers are a band from Saratoga Springs, NY (just a short drive from where I grew up!) that sing children’s songs. It does not appear that all their songs are about zucchini. But that would be pretty awesome, huh? So what’s a person to do when they wake up to a basket full of zucchini on their front porch? You could try making some stir fry, zucchini bread, zucchini fritters, or, of course, RATATOUILLE! Remy makes an excellent ratatouille. 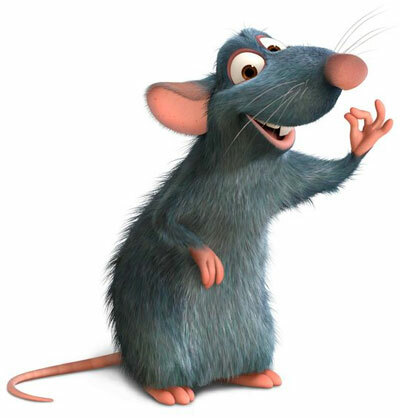 *Image from the movie Ratatouille by Pixar/Disney. dangit you beat me to it! I was freaking out all day that you would beat me on this one because I was so excited for it! hahaha wait til you see my post. I’m waiting for C to get home so I can do the final pic!